The following story appeared in The Washington Times Civil War page on Saturday, May 3, 1997. Copyright 1997 by the Washington Times. Used with permission. On a beautiful April morning in 1862, General Albert Sidney Johnston and an army of 44,000 Confederates launched a surprise attack on Gen.Ulysses Grant’s Army of the Tennessee. Grant’s unsuspecting troops were camped alongside the Tennessee river, a few miles north of the Tennessee/Mississippi border. The two-day fight, the battle of Shiloh, was the largest to have ever taken place in North America up to that time. At the end of the second day, Grant and his army stood shaken but in possession of the field--and victorious. However, if it were not for the insubordinate actions of one of Grant’s little-known brigade commanders, Col. Everett Peabody, the results might have been quite different. Grant’s army of nearly 39,000 had camped in an area known as Pittsburg Landing, a remote region whose few buildings included a small church named Shiloh. In the preceding weeks Grant had successfully pushed the Confederates out of Tennessee by victories at forts Henry and Donelson. He was now taking his time, assembling his forces, preparing to push south from Pittsburg’s Landing toward the Confederate army near Corinth, Miss. Grant was awaiting the arrival of Gen. Don Carlos Buell and his Army of the Ohio, which would give him an aggregate force of about 75,000. But Johnston, commander of all Confederate armies in the theater, was not going to wait for Grant to attack. He decided to make a forced march from Corinth and assail Grant before the two Union armies could merge. Johnston pushed his troops, many of whom had never been in battle, north to Pittsburgh Landing, arriving on April 5. His green troops were not as concerned about stealth as they should have been, frequently firing their weapons into the air or shooting at game--in spite of admonitions. Grant showed little concern over a possible strike by Johnston, and was lodging down river in Savannah, Tenn. He had one of his divisions, commanded by Brig. Gen. Lew Wallace (future author of the novel Ben Hur) encamped at Crump’s Landing, six miles from Pittsburg’s Landing. But Col. Peabody, whose brigade of Missouri, Michigan, and Wisconsin troops was on the western outskirts of Grant’s army, was not deceived. He became increasingly convinced that the rebels were nearby in force. Peabody, over six foot tall and 240 pounds, was a short-tempered man who had been Chief Engineer of the Memphis & Ohio railroad before the war. He tried to convince his immediate superior, Prentiss, that their position should be strengthened. 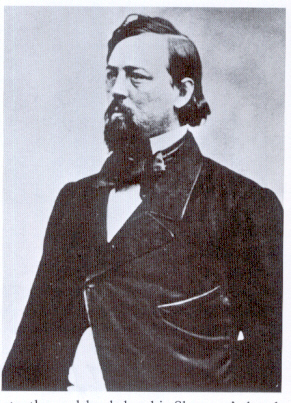 Not convinced, Prentiss ridiculed the idea and refused to authorize any change to the disposition of Peabody’s troops. He hoped that this would temporarily interrupt the Confederates plans and, more important, provide a warning to Union units in time to prepare for the coming onslaught. Maj. Powell’s reconnaissance force first engaged Confederate pickets about dawn, in a meadow known as Fraley field. Driving back the pickets, the troops engaged a substantial force of Confederates behind them, and after a sharp fight were beginning to push them back when they were confronted with the awesome sight of a long line of battle--one that would soon overlap both their flanks. Peabody contemptuously replied that he was personally responsible for all of his actions, and rode away. Prentiss never forgave Peabody, nor gave him the credit he deserved. In his official report of the battle, he barely mentioned his name. Peabody, having had a premonition that he would not survive the battle, took the rest of his brigade forward and met the Confederates head-on, providing an unexpected resistance that clearly disrupted the Confederate timetable. But overwhelming rebel numbers and determination by S.A.M. Wood’s and R.G. Shaver’s brigades soon pushed Peabody back. Both Prentiss and Sherman, careless about taking proper precautions against an attack, made up for their shortcomings once engaged. Sherman quickly rode toward the sound of the guns and began to place regiments and artillery, and reassured his men by calmly directing the defense. Grant arrived early in the morning, saw that Sherman was handling things in his sector, and quickly rode off to check on the other divisions and reinforcements. Thanks to Peabody’s vigilance, Prentiss was not taken by surprise, and was able hastily to assemble a line of battle in time to meet the attack by A.H. Gladden’s and J.R. Chalmers’ Confederate brigades. Although many of Prentiss’s troops broke for the rear, he was soon reinforced and was able to form a solid defensive position on the left flank of the Union line. This position, formed along a sunken road and nicknamed the “Hornet’s Nest” by the Confederates, held out until late afternoon. Finally, Prentiss was surrounded and forced to surrender, but he had bought the time Grant needed to hold the Confederates until the end of the day. The next morning, reinforced by Buell overnight, Grant attacked and drove the Confederates back toward Corinth. Total casualties for the two armies were nearly 24,000 in killed, wounded, and missing. Although captured, Prentiss was soon paroled and returned to active duty. Peabody never saw the fruit of his labor, and indeed never got the recognition he deserved. He was wounded four times in the battle, and was killed when he was shot in the head. Also killed was Albert Sidney Johnston, which was a significant blow to the Confederacy. The Confederate commanders who succeeded him in the west lacked either the skill to face Grant, or the confidence of Jefferson Davis, or both. The long casualty lists of Shiloh staggered the Union, which now realized that the Civil War was going to be a long, bloody conflict.